Ever since Dvořák, in a field tended with love for much of the last century by Mstislav Rostropovich, new cello concertos have not been thin on the ground. 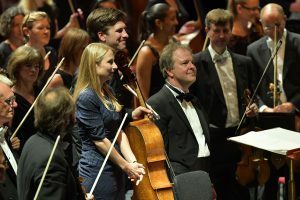 Given its first performance on 14 August, Falling in the Fire is a notably successful contribution to the tradition from Charlotte Bray (born 1982), and the latest knot on a thread of new string concertos running through the BBC Proms season. The composer’s programme-note cunningly parses the blueprint of a Baroque concerto grosso. Varied but related episodes are linked by a recurring ritornello (in this case, two of them). As a cellist herself, albeit no longer playing, Bray has understood like few of her contemporaries how to let the cello lament and sing in an unequal contest with a full orchestra over a turbulent 20-minute span. Guy Johnston’s solo part cut right through to my seat and although he played from score, his grasp of a part written in close consultation was always supple and persuasive. While not notably original, Bray’s harmonic language shuns the bare-faced imitation of elders and betters from some other premiere composers this season. Falling in the Fire opens with an insistent declaration of independence from the soloist, works towards a large, not especially confessional cadenza – intimate moments are unusually sparse for a cello concerto – and ends in something like terror, with the soloist’s identity hanging in the balance, faced with a piercing drone from the orchestra like a man on a road at night blinded by undimmed headlights. The BBC Symphony is on a roll right now, apparently thriving on an arduous schedule. Having taken a neoclassical masterclass from Marc Minkowski in their second Prom of the season, the orchestra fully mastered the tricksy inanities of HK Gruber as well as the vivid timbral blues of Dutilleux and revolutionary reds of Beethoven’s Fifth in a thrilling Prom last week. Their principal conductor Sakari Oramo was on the podium again last night for an account of another Fifth Symphony, by Mahler, that joined with unselfconscious exuberance the growing trend for a kind of enlightened literalism in this music. Nostalgia-tinted seekers of a journey from darkness to light may have been disappointed by a brusque and matter-of-fact opening funeral march. The temptation was stoutly resisted to turn the symphony into a trumpet concerto, though section principal Alan Thomas led a rhythmically tight line. A steadily moving, not indecently hasty pulse held sway. Until the “are we nearly there yet?” contrapuntal B-roads of the finale, Oramo adhered to the humane approach that doesn’t pull Mahler around: he has done all the pulling around for us. Too neurotic in contrasts to be confused with the bumpkin senility that used to be thought proper to a Mahler Scherzo, Oramo’s detail and daring brought a dash of Wozzeck to the heroic horn-calls (Martin Owen) and answering shudders of the central movement’s winding decay, at least until a misadventure in the brass dispelled the mood. The Finnish conductor is also a violinist of distinction, and his work with the strings bore fruit (as it had in the Beethoven) with a shimmering piano sound in the Adagietto, which yielded to each phrase with quartet-style pliancy. 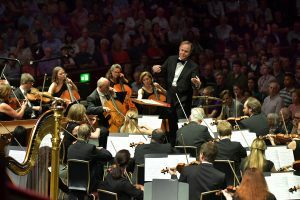 A slimline version of the orchestra brought no less warmth to the concert’s opening Haydn symphony, No.34, in which one could hear their own heritage of playing this always-unpredictable music, stretching back to Sir Colin Davis and Pierre Boulez. For once in a big-band performance, the harpsichord continuo (from Bernard Robertson) wasn’t a clunky anachronism, surrounded like grumpy Grandpa by benevolent younger relatives. 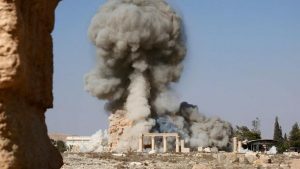 Giving full and deserved weight to the pathos-laden, horn-haunted lines and pregnant pauses of the long opening Adagio, Oramo showed that Haydn is still the old master of surprise. Posted on August 15, 2016 August 15, 2016 by Peter Quantrill	Bookmark the permalink.